Low $5.00 flat rate shipping for any purchase! To the astonishment of the merchants, Sadko managed to catch the golden fish which can return youth if eaten. He is joyfully displaying it to the merchants welcoming him on shore. 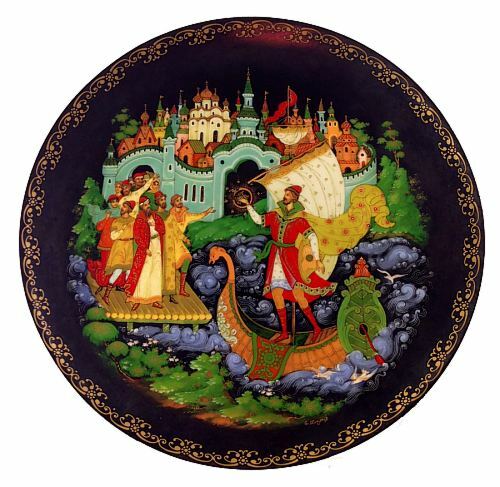 This collectible plate is based on a lacquer miniature by Yevgeniy Populov. The plate is in excellent condition and comes with the original documents and box. Click Here for Additional Close-Up Images! Travelling to Baltimore or Washington, DC? Come visit our gallery. All materials on this site © 2010 Tradestone Gallery. All Rights Reserved.